WATCH Democratic civil war over Ilhan Omar? 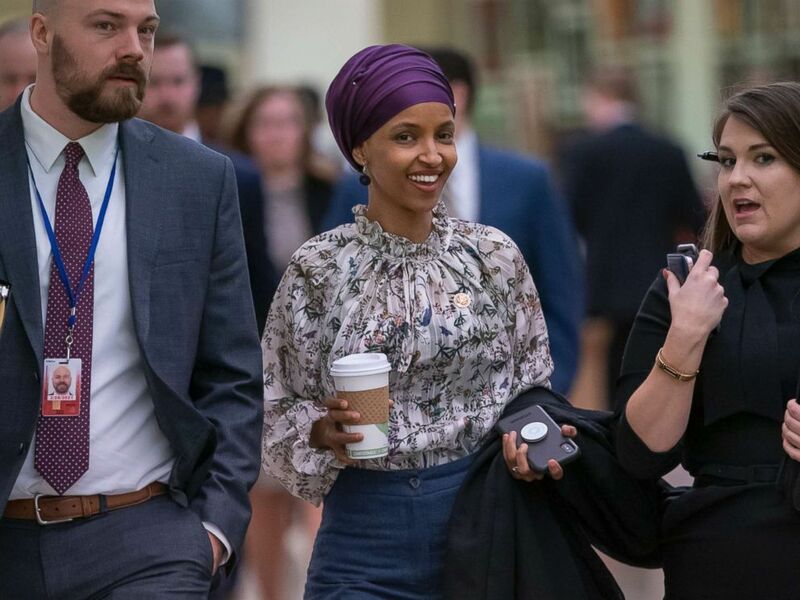 Rep. Ilhan Omar, D-Minn., one of the first Muslim women elected to Congress, in an interview Wednesday, defended herself after backlash over controversial comments she made last month regarding the Sept. 11th attacks. "I took an oath to uphold the Constitution. I am as American as everyone else is," Omar said in an interview on "The Late Show" with Stephen Colbert. Omar, a freshman in the House of Representatives, has faced criticism over a comment she made at a Council on American-Islamic Relations event last month, stating that the Muslim civil liberties organization was founded after the Sept. 11 attacks on the World Trade Center because "they recognized that some people did something and that all of us were starting to lose access to our civil liberties." According to its website, the organization was actually established in 1994. Omar gave the full speech, according to a fact check by the Washington Post, roughly one week after the deadly shooting spree at two Christchurch, New Zealand mosques that left 50 people dead. She sought to urge Muslims to speak up for themselves. "Many people expect our community to feel like it needs to hide every time something happens," she said in the speech. "But repeatedly we have shown them that we are not to be bullied, not to be threatened, we are not to be terrorized, we are strong and resilient, and we will always show up to be ourselves because we know we have a right to a dignified existence and a dignified life." Abridged versions of Omar’s comments were circulated on social media, and on Thursday the headline on the cover of the New York Post read: "Here’s your something," across an image of the World Trade Center towers burning. Rep. Ilhan Omar walks through an underground tunnel at the Capitol as top House Democrats plan to offer a measure that condemns anti-Semitism in the wake of controversial remarks by the freshman congresswoman, in Washington, D.C., March 6, 2019. Another freshman Democrat, Rep. Alexandria Ocasio-Cortez, D-N.Y., took to social media to defend Omar. "I’m not going to quote the NY Post’s horrifying, hateful cover," Ocasio-Cortez wrote in a post on Twitter. "Here’s 1 fact: @IlhanMN is a cosponsor of the 9/11 Victim Compensation Fund. She‘s done more for 9/11 families than the GOP who won’t even support healthcare for 1st responders- yet are happy to weaponize her faith." Omar, along with a number of other House Democrats, is pushing for legislation introduced this week that aims to repeal the president’s travel ban, against people from predominantly-Muslim countries, an action which was narrowly upheld by the Supreme Court last year. The ban applies to citizens from Iran, Libya, North Korea, Somalia, Syria, Yemen as well as Venezuela. "I have said this before, and let me say it again: I believe this ban will go down in history as a moral stain on our country’s history," Omar said at an event Wednesday focused on the measure. Rep. Ilhan Omar says President Trump's travel ban will "go down in history as a moral stain" on the U.S.